Corrosive, funny and provocative in the extreme, debut writer/director Dylan Kidd ‘s dual coming-of-age odyssey was 2003’s standout indie belter. It gives us Roger (Campbell Scott), a sexual super-predator prowling the Manhattan urban jungle: razor tongue, velvet cynicism and (of course) buried self-hatred. 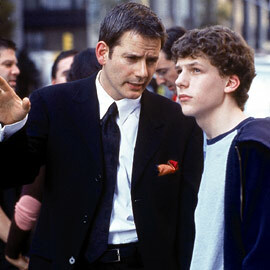 Who better to take his timid 16-year-old nephew Nick (Jesse Eisenberg) on an unforgettable night of seduce-and-destroy cherry-bursting? Tilting from ice-queen Isabella Rossellini’s slinky high-rise party to the pounding inferno of an underworld brothel, Kidd’s glinting LaBute-ality is staged but never stagy, his peek-a-boo shaky-cam eavesdropping us onto every barbwire witticism of the fastball dialogue – which, line by line, is smashed out of the park by his cast. Jennifer Beals and Elizabeth Berkley sidestep expectations. Eisenberg is a wonderfully twitchy find. But Scott is as good as it gets, peddling the sophisto-sleaze like a pro and somehow finding pathos in bruised misogyny.